Hi gang – sorry no posting in a while. I’m working on the MisAdventures every day, but things are just not that interesting to look at, like new plywood overlay over the upstairs floors and wood casings for doors. I’m almost finished with this one design element, so I’d thought I’d share for the end of June. This 8′ pine panel is carved with a CNC machine. The big problem was that I wanted a vine leaf design in the background that matched the leaves in the chandeliers. After 20 different sign makers said ‘can’t do it’. I found a craftsman out by D’Arcy’s neck of the woods in Seattle Washington. He could code the vector files and do the carving. It took him two tries and I spent another 60 hours sharpening up the carving, antiquing and finishing. I still have the trim to fabricate before we move upstairs. I guess I’m just a little obsessive about these things. So Art project it is. 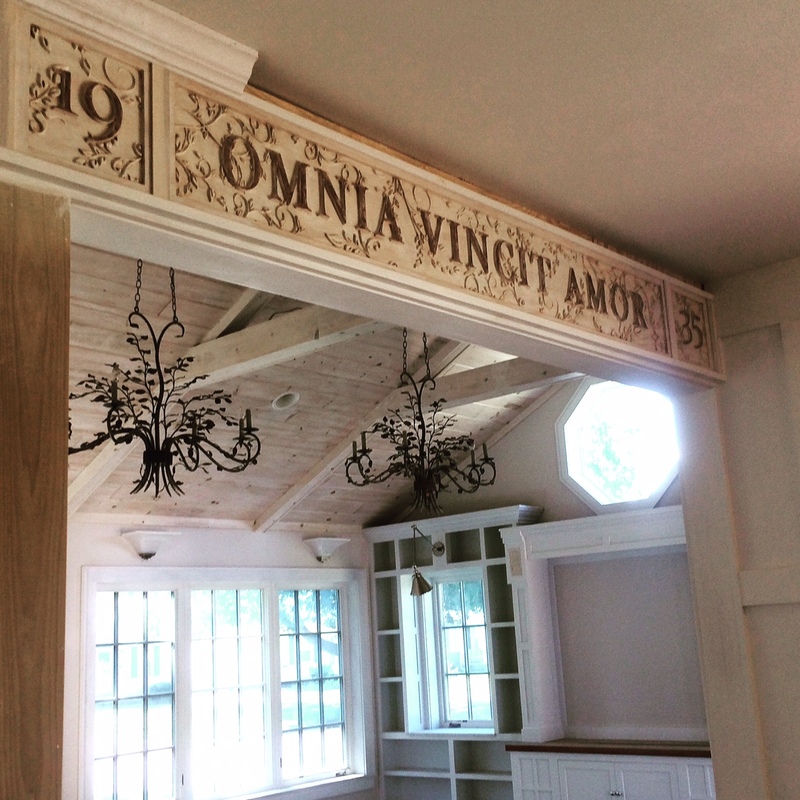 The text is Latin from the Roman poet Virgil, from his work Eclogue X. Omnia Vincint Amor – Love Conquers All. The ‘1935’ is the year the house was built. So now, more than ever, we need a little more Love in the world. Here’s my small contribution.